Ritchie Blackmore: enigmatic, inspirational, temperamental, mischievous…a complex character who demanded the very best from himself and his almost countless co-musicians throughout the roller coaster history of the band he founded in 1975 until its final demise in 1997. Rainbow began as a ‘side-project’ whilst Blackmore was still very much an active participant in Deep Purple. But, increasingly frustrated at the funkier direction Purple was taking and also annoyed at the lack of interest in his suggestion of recording a cover version of ‘Black Sheep Of The Family’, Blackmore recruited Deep Purple’s recent support act to help him record the song as a solo project. 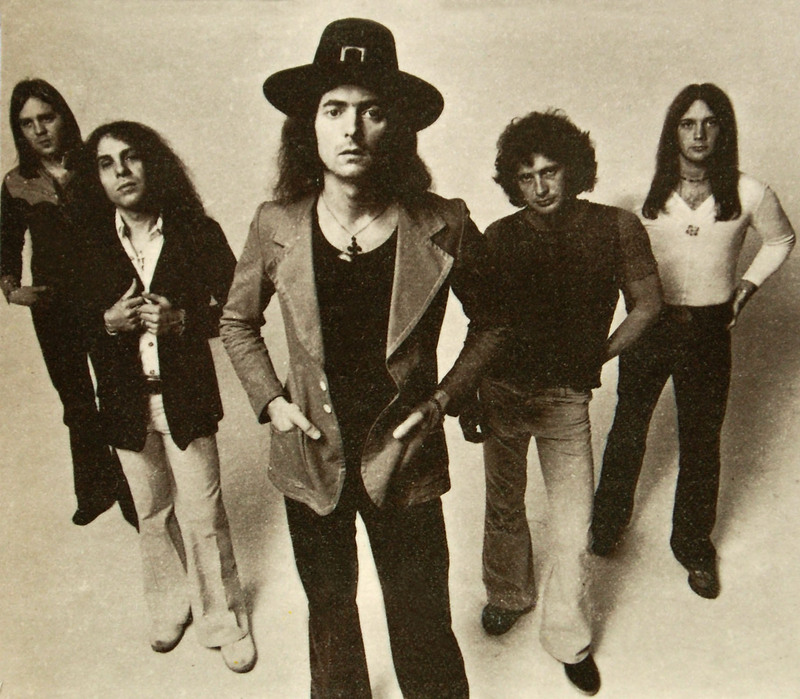 Ronnie James Dio and the other members of Elf (minus the guitar player of course) sparked Blackmore off onto a new path, giving him complete control of the creative direction and output of the new band. This direction would veer off and u-turn many times over the next two decades, seeing numerous line-up changes as he sought to continually improve the sound and even crave the commercial chart success he had once blithely dismissed. Even a return to Deep Purple was not out of the question, placing Rainbow ‘on hold’ for several years until the old arguments and adversaries reared their heads once more, prompting yet another Deep Purple split. Rainbow would return for a final swan song album and tour before Blackmore finally ‘retired’ from heavy rock, turning instead to the lutes, mandolins and acoustic guitars of renaissance music. Rumours of reunions and revivals of classic Rainbow line ups would persist for years until the untimely deaths of Cozy Powell in 1998 and more recently, the hugely influential Ronnie James Dio. It was always unlikely that Blackmore would be prised back into the heavy rock arena and now that opportunity is gone forever. What remains is an impressive legacy that is incredibly diverse, spanning most genres of music, including classical, pop, metal, rock, blues and even funk, yes, funk. The sound of Blackmore’s first ‘solo’ album in 1975 is remarkably similar in parts to the ‘Stormbringer’ album he so publicly dismissed as being inferior at the time. Each subsequent Rainbow album would evolve and change, some radically so from their predecessor, others more subtly different. The Rainbow project was always unpredictable, often exciting and has, at the same time, fascinated and frustrated fans throughout its lifetime. I agree, it’s a brilliant website. One thing: wasn’t it the Munich Orchestra on ‘Stargazer’ i.o. the Berlin one? I am a big fan of Ritchie.Right now collecting magazine or book featuring him.Your website are great man..Keep on updating or scan photos or interviews on the man.Yes i need new updates.Thanks a million. The 22.11.77 gig was at Cardiff Capitol, not St David’s Hall. I was there, had a chat with Cozy during a break in his sound check (during which they were playing Abba on the PA). The gig was amazing. The drum techs put too much explosive in the kit as a last night of the tour prank; when the kit exploded at the end of his solo I saw a drum fly over the heads of the audience. It was lucky no-one lost their head. Then the strat got trashed, thrown into the audience and hauled back to stage like a grappling hook. It was a relief to see no-one got impaled on its splintered remains.